Submitted photo From left: Jennie Gallimore, associate dean for research and graduate studies at the College of Engineering and Computer Science; Brandy Foster, executive director of the ONEIL Center for Research Communication; Hernan Olivas, president and chief executive of O’Neil & Associates, Inc.; Wright State President Cheryl B. Schrader; Wright State trustee C.D. Moore II; Nathan Klingbeil, College of Engineering and Computer Science dean; and State Rep. Niraj Antani. 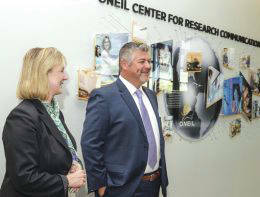 Wright State President Cheryl B. Schrader and Hernan Olivas, president and chief executive of O’Neil & Associates, Inc., during the grand opening of the ONEIL Center for Research Communication. FAIRBORN — A center designed to strengthen technical communication by scientists and engineers while giving students from other disciplines a place to develop the art of research communication has opened its doors at Wright State University. 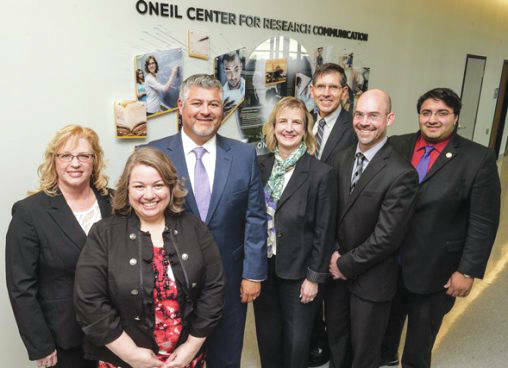 A ceremony to mark the grand opening of the ONEIL Center for Research Communication was held Sept. 19 at the university’s Neuroscience Engineering Collaboration Building, where the center makes its home. The center was launched thanks to a $675,000 gift from O’Neil & Associates, Inc., a 70-year-old Dayton-area technical communication company with a network of national customers. No university funds were used for the center, which is intended to become self-sustaining. “We see this as an opportunity to invest in our future,” said Hernan Olivas, president and chief executive of ONEIL. Brandy Foster, lecturer and director of technical communications in the College of Engineering and Computer Science, is the center’s executive director. She said scientists and engineers must be able to communicate their ideas to their colleagues and potential collaborators, funding agencies, end users and the general public. They may have never focused on developing communication skills, or English may not be their primary language. The center is hiring Wright State student interns from the Dayton and Lake campuses who major in English, communications, motion pictures, business management, computer science and graphic design. There are currently six student interns, with plans to hire three or four more. The student interns will provide students, faculty and outside businesses and organizations with writing, editing, graphics, video, web development and other services for dissertations, theses, grant proposals or other technical-writing needs. The students will also help run the center, getting entrepreneurial training. The center is located on the third and fourth floors of the NEC Building. Clients can come in and use the center or submit their dissertations, grant proposals and other writings to the center electronically for editing. All of the revenue generated by the services will be re-invested in the center. Foster said fees charged to Wright State students and faculty will be less than 10 percent of what they would pay for outside professional services. Foster graduated from Wright State with bachelor’s and master’s degrees in English. While she was a student, she was hired by a mechanical engineering professor to serve as technical writer and editor for his graduate research group. “As an English major who was focusing on 19th century British literature, I learned more than I ever thought I could about mechanical engineering,” she said. As she edited theses, dissertations, grant proposals and monographs, Foster became convinced of the value of partnering English, business, arts and other non-STEM majors with science and engineering students to strengthen technical writing. She became an evangelist for creating such a center and won the support of Jennie Gallimore, associate dean for research and graduate studies in the College of Engineering and Computer Science, who worked with Foster on a business plan. The center also plans to establish a fellowship named in the memory of Robert J. Heilman, the late CEO of ONEIL. The fellow will conduct research in areas of interest to the company. https://www.fairborndailyherald.com/wp-content/uploads/sites/50/2017/09/web1_19477_008-2-508×368.jpgSubmitted photo From left: Jennie Gallimore, associate dean for research and graduate studies at the College of Engineering and Computer Science; Brandy Foster, executive director of the ONEIL Center for Research Communication; Hernan Olivas, president and chief executive of O’Neil & Associates, Inc.; Wright State President Cheryl B. Schrader; Wright State trustee C.D. Moore II; Nathan Klingbeil, College of Engineering and Computer Science dean; and State Rep. Niraj Antani. https://www.fairborndailyherald.com/wp-content/uploads/sites/50/2017/09/web1_19477_023-260×197.jpgWright State President Cheryl B. Schrader and Hernan Olivas, president and chief executive of O’Neil & Associates, Inc., during the grand opening of the ONEIL Center for Research Communication.